Elmer Eisnor lived in Halifax and worked as a shipper/receiver until his retirement. Around 1986 he saw a carved deer's head, and thought to himself, "I could make one like that." After a few tries he was successful. He is best known, however, for his snakes. 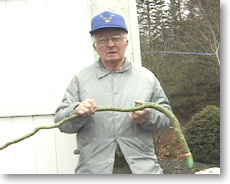 An avid hunter, Elmer noticed as he moved through the woods during hunting season, that some of the exposed tree roots he came upon looked like snakes. It wasn't long before he was collecting the best roots he came upon, and taking them home to be converted into brightly coloured snakes. Elmer Eisnor also carved fish, birds and canes.